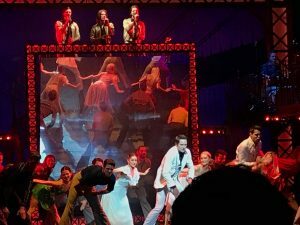 The show was directed by Bill Kenwright and stared Richard Winsor as Tony Manero and Kate Parr as Stephanie. 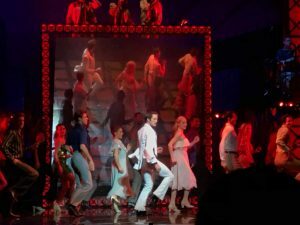 On the 27th November I was invited alongside Wicid.tv to the Wales Millennium Centre for a performance of ‘Saturday Night Fever’ based on the 1977 John Travolta movie. Whilst I have heard of the film I chose not to watch it so I could avoid bias or be focused on what they changed. With that in mind, as far as movie based adaptations go this wasn’t bad. The absolute highlight of the show was the music based on the 1970’s band ‘The Bee Gees’. Hearing a musical cast adapt the brothers Gibb’s music was astonishing. The songs were not forced and made sense in the context of the story. For example, when Bobby C (played by Raphael Pace) was going through emotional conflict he sings the famous 1979 song ‘Tragedy’ and not only does Pace manage to not copy or try to impersonate the band but he also manages to still act his heart out and convey emotions throughout. Similarly, the three main members of ensemble were dressed as the three brothers and were very effective with their vocals and on-stage presence. Another highlight of the show was the set design. This was very effective as it helped convey the time period with obvious references such as the interiors of houses and the costumes chosen (including the famous white suit) but more subtle details such as a ‘Rocky’ poster in the main characters room. The lighting also helped the story progress with the use of the portal. It was displayed on the left, right and top of the stage which displayed gorgeous and relevant colours to help the mood. When a character’s dancing, the portal would flash orange, green and red but when a character has an emotional ballad the colour transformed into a soft blue. A factor I found very interesting was the on stage band. Whilst not prominent or displayed very well… having them play on the set helped the audience understand the importance and overall relevance music had on society at the time. While minor, I still found it to be an interesting detail. The production overall worked really well and would be elevated even more if the characters around them were interesting or memorable; unfortunately this is where the negatives kick in. the main fault of the show is that the characters aren’t interesting and are very clichéd. For example, Tony is very bland and just feels like Danny Zuko from Grease only with more profanity. His character’s only purpose is to be vain and chase around girls. Stephanie is also quite a weak character with little to no motivation, lack of development and no character arc. The two characters who I will say were interesting were the previously mentioned Bobby C, due to his development and a shocking resolution to his character, and disco DJ who is so loud and entertaining you’ll be guaranteed to get at least one laugh out of him. The biggest complaint I have with it however is the dancing. Now don’t get me wrong, the moves are good and captivate what it is like in not only a night club but a 70s one at that. The problem is the lack of enthusiasm towards the dancing. 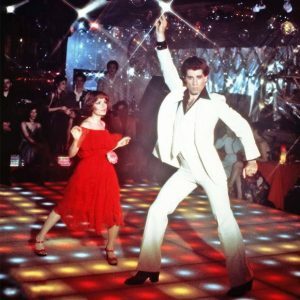 The actors’ faces seem more focused on their choreography rather than just having a good time at the disco. Because of this, I was more focused and distracted by their facial expressions rather than the dancing and moving. To find out What’s On at the Wales Millennium Centre click here. Thank you once again to the WMC for the hospitality, credit to the staff for offering such a warm and welcoming environment for show goers. I look forward to my next visit!